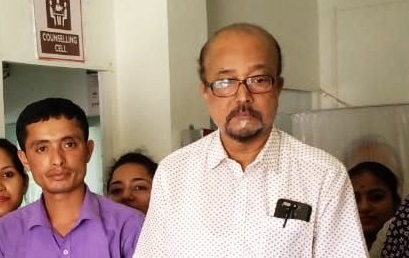 At a time when there have been claims and counter-claims over the destruction of the Veterinary Science College playground at Khanapara in Guwahati between the Assam Agricultural University authorities and the Assam Bharatiya Janata Party (BJP), BJP’s Mangaldai MP Ramen Deka has appealed to Sarbananda Sonowal-led State Government to think over the matter. The senior BJP leader expressed before Northeast Now about the need of a place instead of playground to organize public protests and political meetings. Earlier, former Ranji players, sports organizers, various other organizations demanded Chief Minister Sonowal’s intervention into the matter. Stating that “there is no such place in Assam”, Deka said that there is need of a place in Guwahati where two to three lakhs of people can gather at a time. It may be mentioned that the inaugural ceremony for setting up of 19 cancer hospitals across Assam has been scheduled to be held on June 18, 2018 in this playground. After the appeal of the ruling party’s senior MP to the Assam Government to think over a separate place for organizing public meetings instead of playground in Guwahati, the role of Chief Minister Sarbananda Sonowal, who wants to ‘turn Guwahati into a sports capital’, would be significant. This multi-facility sports project, covering 46.60 bighas of land, was established in 1977 for development of various sports.